Each piece of Goff Creek Pottery is handmade by artists Mary Lynn and Robert Good in our New York State studio at the historic Wm. Goff House, circa 1830. Once the only settlement between the bustling towns of Bath and Dansville, about a 40 mile span, William Goff arrived here at this location in 1812, building his family home and creating an early 19th century hub, operating grist, carding and fulling mills, an inn, post office, distillery and tailor shop on the stagecoach line. 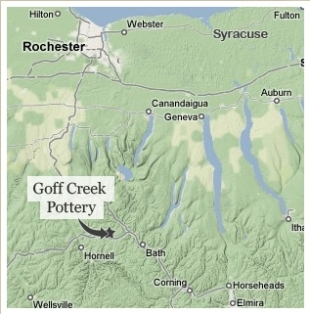 Goff Creek Pottery is located about 30 minutes away from Keuka Lake in the beautiful Finger Lakes region of New York state famous for its natural beauty, glacier lakes, hiking and boating, local vineyards, art and antique shops, museums and year-round festivals.